Performance Skills: a comprehensive, participatory and hands-on workshop including how to deal with amplification/sound systems, stage deportment, focus and relaxation, how to talk about your music on stage, choosing your performance wardrobe, what to do about mistakes, handling awkward moments, and much more! Neck, Back and Shoulders Pain Free! Pain and discomfort do not have to be part of your music experience. In this workshop you will learn how to play pain-free for a lifetime (and the way to achieve this may not be what you expect)! Hands and Arms Pain Free! Pain and discomfort do not have to be part of your music experience. In this workshop you will learn how to play pain-free for a lifetime (and the way to achieve this may not be what you expect)! Contact Laurie at laurie@laurieriley.com to set up a workshop for your group, or private lessons. Laurie Riley has practical, immediately usable tips here for you. 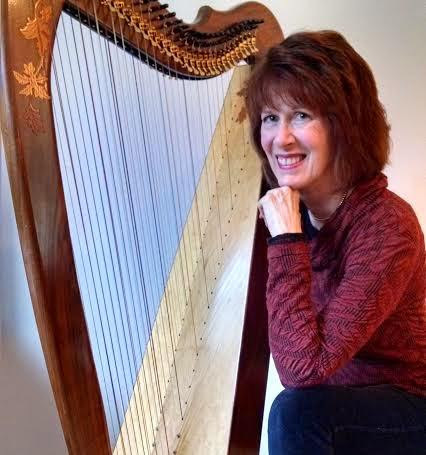 Her 30 years in the harp world have given us bedside music at hospitals, introduced us to double strung harp, helped up with great Celtic style, and solved aches and pains for many a harper. Enjoy these tips! There is an action sheet at the end that you can download and put on your music stand. Laurie, what are some of the things we need to check if we are having back pain at the harp? One of the biggest culprits in back pain is the common posture that most of us were taught was “correct” ever since we were little kids. We were told we must roll our pelvis forward and thrust out our chest to make ourselves tall. This puts excess curve in the lower back, stressing muscles along the spine all the way to the neck. Most of us are so accustomed to this posture that it has come to feel natural. In fact it is anything but natural. Roll the pelvis back a few inches and let your lower back relax. It will probably feel as though you are slouching, because it’s not what you’re accustomed to. But if you look in a mirror you will see that your back is now straight. You will also feel your abdominal muscles engage a bit – that’s a good thing – it means they can now do their job, which is to take half the responsibility of holding you upright. It can take several days to get used to this, but it will soon feel better, and you may notice less fatigue. While playing, remember every few minutes to relax your pelvis into this better posture, until it becomes habitual. Check yourself in the mirror often. You may experience a great deal less back, hip, neck and even shoulder pain! Of course, this is not the only solution for discomfort while playing. Assessment by a professional ergonomist is always advisable. How high should we hold our elbows? The muscles at the top of the arm and across the shoulder can be damaged when held in flexion for long periods of time on a regular basis. But that’s exactly what you are doing if you always hold your elbows high while playing. Salzedo, the great teacher who is credited with the idea that the elbows must be parallel to the floor, never meant for harpists to do that beyond the beginning stages of learning. He asked new students to keep elbows high because so many of them pressed their elbows against their ribs and he wanted to break that habit. In actuality, the elbows should float freely at about 45 degrees. This provides maximum freedom of movement without compromising muscle health. Be sure never to clench your elbows against your body. Many new players do this because they think they have to steady the harp with their forearms. What is something else to look for when we find ourselves clenching elbows against our body? If your harp wobbles while playing, there is a balance problem. A good teacher can provide details on how to best hold the harp. What is “raising” and how does it help? Hand raises are necessary for relaxation and best tone. A raise only needs to be eight inches or so. In the time it takes to do one, you can relax your hand. Also, it gets your hands and arms away from the harp so they don’t interrupt sound waves that travel off the harp. A great experiment you can do right now is to play a big chord without a raise, and then play one with a raise, and listen to the difference. It will convince you! When do we refrain from “raising”? When playing faster pieces there is often no time for raises. What are three pieces of wisdom for a beginner? 1. Take your time. Allow yourself to be a beginner for a long time, even if you are already accomplished on another instrument. Learning the harp is not instantaneous. 2. Learn good technique !!! 3. Don’t keep playing when it hurts. If pain develops, something is wrong. 1. Give yourself months of practice on every piece you learn before you perform it. 2. Practice with the purpose of developing muscle memory. 3. Once you get your technique, concentrate on making the music beautiful. You play both single strung and double strung harp. What would you like to tell people about double strung harp? It does things single-course harps cannot do! It sounds like two harps being played at once, and it’s FUN! If you enjoy learning new techniques and exploring new sounds, this may be the harp for you! Is is harder than single strung harp? No. It just requires a brief period of visual adjustment. What can be done on a double strung harp that cannot be done on a single? Echoing, overlapping chords, playing melody and chords in the same register, doing doubled ornaments, using different tunings for each row, pre-setting levers for accidentals so you can just play them with the other hand, and so much more! Is it hard to switch back and forth from double to single? No, except that when I go back to single, I feel like I don’t have enough strings. With only one row of strings, the hands have to play in different octaves or they will run into each other. They can’t overlap freely as they can on a double. I play Sitar . I am keen to use the music I play as therapeutic music for healing. I live in Melbourne Australia. Can you pls guide me. Please contact the National Standards Board for Therapeutic Music: http://www.nsbtm.org/member-directory/accredited-programs to see what training program sare accredited. Your best programs may be the Music for Healing and Transition Program or the Clinical Musicans program, both of which accept instruments other than harp.